Professionally merchandise your baked goods and ready-to-eat foods with this Cambro 92615MT140 9" x 26" green fiberglass market tray. 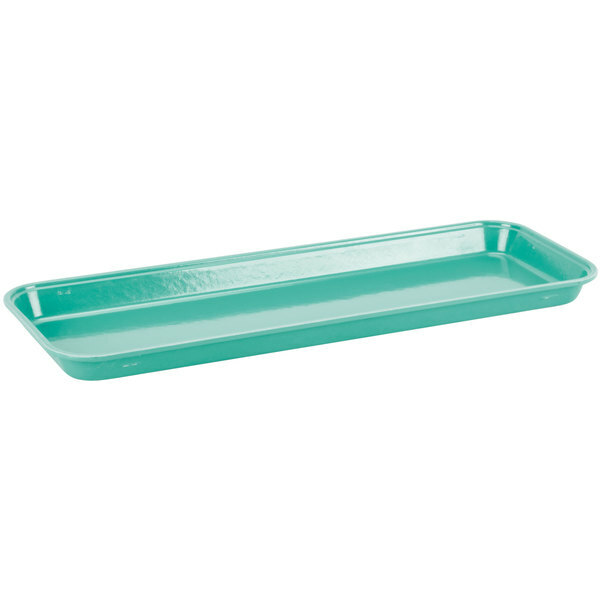 Great for supermarkets, delis, bakeries, and diners, this tray's sleek design is perfect for showcasing your most popular freshly baked goods, meats, and deli goods in display cases as well as front-of-house merchandising presentations. 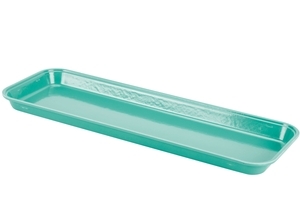 Its 26" length is perfect for showcasing a wide variety of pastries side by side, and its bright green color is sure to make your colorful foods pop for an eye-catching presentation. This item can be customized to promote your brand, company, or event. Built with versatility and durability in mind, this tray features a reinforced, high-impact fiberglass construction to provide long-lasting use in your high-volume environment. Best of all, the easy-to-clean material resists stains and odors, and will not oxidize like aluminum. Dri-Stak stacking lug separators promote air circulation around trays, allowing the trays to dry faster than traditional plastic and aluminum market trays. 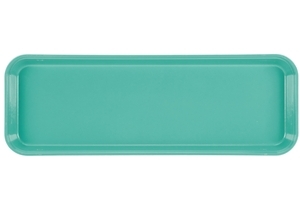 The tray's narrow, 1 1/2" rim securely holds the tray's contents during transport or selection without obstructing patrons' view of your decadent options. Customize this tray with your company's logo! You can boost your brand recognition and leave a lasting impression while you serve your customers' favorite baked goods and foods.